In many cases, the origin of these questions lies in the same place, and it is at the bottom of the grill. It almost seems odd that such an early step like starting the charcoal can have such an impact on the end product but, in so many cases, it does. The concern, of course, is speed. 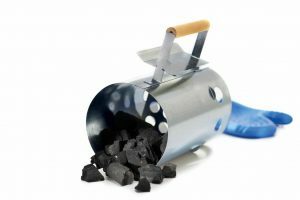 The easy solution to getting things going is the liberal use of charcoal lighter fluid, or buying the quick-light briquettes that are just soaked in the fluid before bagging. But with ease comes a drawback, which is the likely bad impact on flavor. Other methods, like using wood or kindling as starters, can draw out the process, and are not always reliable. The best middle ground, for many, is the charcoal chimney fire starter. What looks like a large tin can someone poked holes in and then added a handle are really carefully engineered gadgets that should be part of any griller’s arsenal. But, for something seemingly so simple, there are some fairly specific charcoal chimney starter instructions. The initial decision involves choosing which one to use. There are several styles and sizes, and sometimes the differences between some styles can be hard to spot, while others look like totally different products. But with a little research, experience, and perhaps borrowing from a friend to test, getting just the right one can reward the effort. The most obvious difference to many is the handle. Some charcoal chimney fire starters have longer handles, some shorter. Some have handles, which are rigid, and straight, some are angled or hinged. Add in various shields for deflecting heat and protecting fingers, and the choices can become dizzying. All of these differences are there for a reason, like grill type and size, room for storage, and more. So take the time to consider these things before making your final decision. But at their core, they all do the same job, so the charcoal chimney starter instructions don’t vary much between models. Using a charcoal chimney starter really only requires three items besides the chimney itself: coal, paper, and a lighter or match. Leave the lighter fluid in the garage (stored safely, of course). The decision on which coal to use is up to individual choice, and experience should be the guide on which is best. The charcoal grill starter will work with virtually all of them, though avoid any of the pre-soaked varieties. 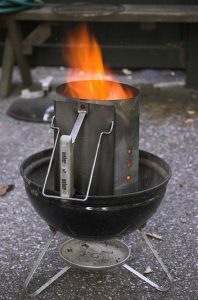 Don’t forget, these devices are really for getting that initial round of coals started, so keep it simple and add those mesquite or other infused briquettes later on. Since the cooking is being done without propane gas or flammable liquids, matches seem the first choice, but lighters do just fine. It is the paper that can be the one tricky part of the process. Focus initially on getting a good supply of newsprint. The morning paper can become the best friend to those using this method of starting charcoal. Lighter paper like napkins burn too quickly and heavier grades, especially glossy magazines, just don’t burn properly, if at all. Refer to the charcoal chimney starter instructions for additional advice. Notebook paper can sometimes be used in a pinch, but it isn’t really the best. Expect to use 6-8 pages of newspaper, torn in half. Roll them loosely, roughly an inch diameter. Too tight prevents air from circulating properly, too loose and the paper burns too quickly. Some charcoal chimney starter instructions call for the paper to be wadded. In many cases, this works just fine, but it can make for uneven heat or lighting. One quick piece of advice is to let children if they are present, do this step. It lets them be involved in the process and gives them something to do. The same can be said of some adults, as well. Once the rolls are made, wrap them into the bottom of the charcoal chimney fire starter. Again, be careful not to overstuff. The size of the starter will dictate just how many rolls are needed. The bottom is normally the shallower of the two ends and has the larger vent holes around it. 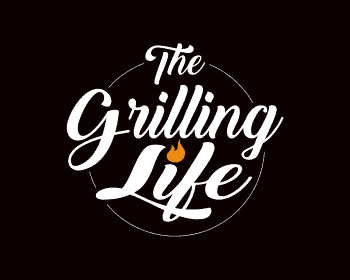 Place the device on a safe, flat spot, usually the charcoal grate in the bottom of the grill. This is where the handle choice comes into play, as the size of the grill and the dimensions of the starter need to work together. If this is being done without a grill, for example during a campout or for use with a Dutch oven, prepare a safe area first. Clear out any debris, keep a supply of water at hand, and try to elevate it since the heat can damage the ground. Add the charcoal now. Some models have lines indicating how much charcoal to use, but in general, the charcoal chimney fire starter could be filled to the top, but not over it. Using the minimum amount of charcoal needed for your desired cook will save you money in the end though. You can always add charcoal later if you miscalculated and need more. When placing the starter, make sure there is nothing obstructing air from getting into it from all sides. Placing the charcoal fire starter too close to the edge of the main grill wall can interfere with this, so center it as much as possible. Now comes the fun part: Lighting it. Check with the charcoal chimney starter instructions from the box for details, but in general, where the starter source is placed does not matter. And while there is nothing explosive about this part, keeping curious eyes at a distance is always advised. Light the paper in one location, and let the flames work their way around the cylinder. Resist the temptation to blow, as a second starter source will cause the whole thing to go too fast, not to mention you can end up with a face full of hot sparks. This is where how tightly the paper is rolled will be tested. If all goes well, flames should become visible in just a few seconds inside the bottom of the starter, but not coming through the holes. And smoke should quickly be seen coming up through the charcoal. If the smoke is not visible, there could be something blocking the airflow, which prevents the device from working properly. No smoke usually means the paper is too tight or your charcoal is packed in too snuggly. Lots of visible flames indicate it is too loose. If the first try doesn’t work, let things cool down and make adjustments. Now, step back and observe. The physics of the starter focus on funneling the heat up through the charcoal, getting it up to the needed temperature to ignite. This is not an instantaneous process but usually takes about 10-15 minutes. Even after there is no flame or even paper visible at the bottom, as long as there is smoke there is heat. This time is a good excuse for refreshing your favorite beverage or getting other prep work done, though make sure never to leave the chimney completely out of sight. At some point, the flames will die down and that wonderful orange glow will appear. Once the coals have a nice white-hot ashy exterior, they are ready to go. This is the second point where the handle comes into play. Lift the entire thing, carefully using the handle, and pour the coals out onto the grate. I suggest using a heat resistant BBQ glove while handling the super-hot chimney starter. Do not dump the coals, as this will send embers flying, making for a dangerous situation. Tilt the chimney and shake the coals out slowly. Again, it is advisable to use gloves or at least a pot holder to protect fingers. Carefully place the charcoal chimney fire starter to the side. Even though most will cool rapidly, there is still a lot of heat involved. Beware of little fingers, if any are around. No bitter taste from lighter fluid and no danger of a fireball to the face, either. 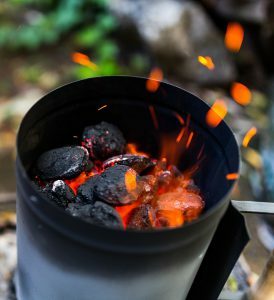 Using a charcoal chimney starter can be simple, especially with experience, and helps re-use paper that could otherwise end up in a landfill. But as with any cooking session, the end doesn’t come until everything is cleaned and stored. Air flow is critical for the chimney to work properly, so removing all debris from it between uses will maintain efficiency. Refer to the charcoal chimney starter instructions for any additional recommendations. 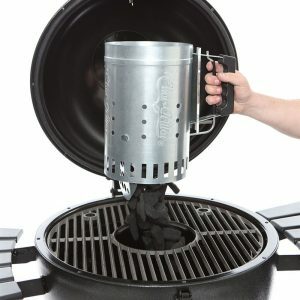 As promised, you can find some great can’t miss charcoal chimney starter options by following the link below. 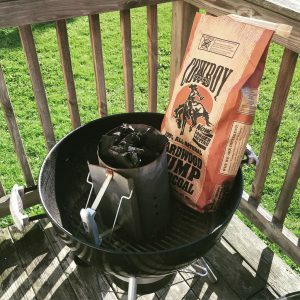 These are all tried and true, highly rated charcoal chimney starters and I am positive you will be able to find the best option to fit your budget and needs. 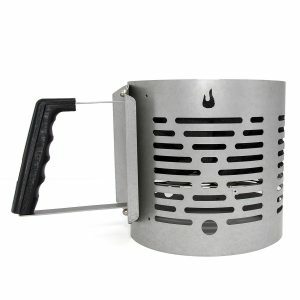 Click Here For An Awesome List Of Top Rated Charcoal Chimney Starters. Check them out, and see which one works best for you. If you’ve found one that works well for you, or have any feedback, let me know! I am always happy to hear new and improved ways to use the grill.